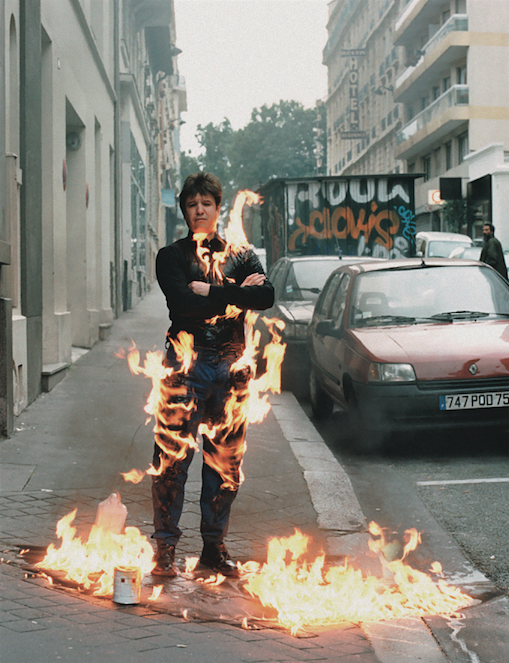 “Talking About A Revolution” is an exhibition that takes its name from the famous song by Tracy Chapman. Even if you can’t start the revolution, at least you can talk about it. The artists invited to show their work at 22 Visconti, art space created by Armelle Leturcq and Frank Perrin, in May 2018, exactly fifty years after May ’68, are not revolutionaries or activists so much as they are “unreconciled.” Harboring no illusions about the sustainability of capitalism and its system of planetary exploitation, the artists convey a persistent hope for a better political and social organization, while keeping their eyes wide open to the times. Whether or not they lived through May ’68, they are careful to avoid coming across as veteran militants or freedom fighters, privileging instead an attitude and practice as concerned artists. Fifty years on, little remains of May ’68 but a brief mention in history class. Not because time has gone by and its leading characters, the Baby Boomers, have grown old or passed on. Instead, it was the ultimately moderate nature of the event that condemned it to oblivion. We know of Nanterre’s Movement of 22 March, the Latin Quarter’s barricades, and the trade union strikes that sparked the Grenelle agreements. But did those events add up to a global revolution? No, just a restless moment in France, one which happened to coincide with a similar sense of restlessness – fueled by a longing for emancipation among the world’s youth and everyone left behind by global development and the triumph of the marketplace – which resonated in places like Prague, Los Angeles, and Berlin. May ’68? Let’s not dismiss it just yet. 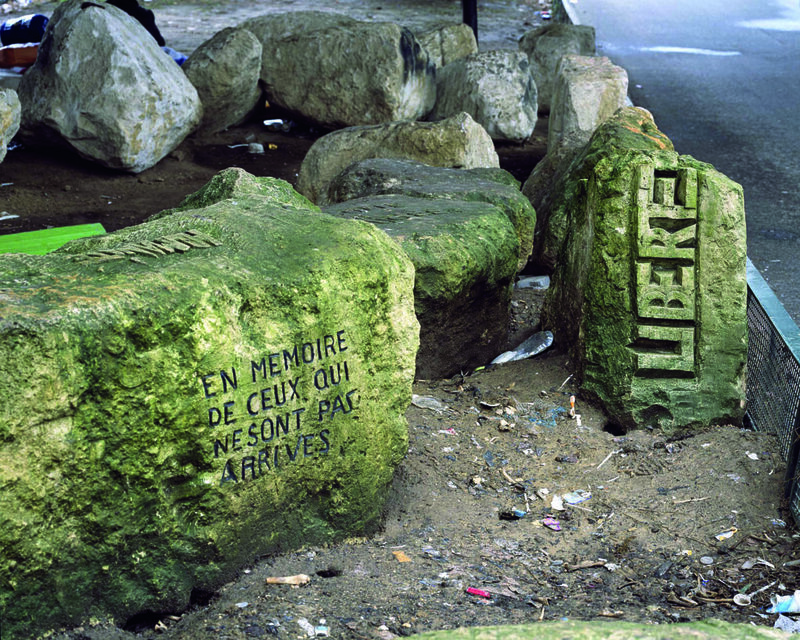 Let’s not go the way of La Pensée 68’s main opponents, that group of fossils who are still numerous today and as eager as ever to interpret the events of spring 1968 as, at best, the pubescent freak-out of frustrated citizens or, in a much darker cast, the onset of moral decline in La Belle France. But in spite of its excesses, its revolutionary but decontextualized lyricism, and its slew of near meaningless slogans (“It is forbidden to forbid”), May ’68 still managed to “produce” a clear result in terms of its impact on politics and mentalities. To this day, the spirit of ’68 continues to purge our mindsets of outdated reflexes, putting an end to gerontocracy, puritanism, paternalism, sexual segregation, and control over culture and the media. Its goal was to cut France free from the corset of the Third Republic and the dreary detour of Vichy and all its corporatist and nationalistic tendencies. It aimed to liberate desire by appealing to a horizontal spirit of fraternity, free from any hierarchy. In all its fundamental tendencies, the Spirit of ’68 called for a rejuvenated France, one more equal, more unified, more emancipated, and, above all, less traditional, throwing out neither the baby nor the bath water. But preserving the Spirit of ’68 and its sociopolitical advances will require us to take a measured and lucid view of things. May ’68, to the dismay of many a do-or-die defender of Liberty at any cost, was not a turning point in civilization. Did it signal the clear expression of a new standard, the hope for a collective sigh of relief, the shift towards a culture based on change? Certainly. But, for the historian, it bears little resemblance to political high-water marks like 1793, the July Revolution of 1830, the Europe-wide Revolutions of 1848, the Paris Commune, or even the Popular Front. May ’68 issued a demand for greater liberty and dignity, but – we must add – without overthrowing the “bourgeois” order so despised by its paving stone-waving troops. In fact, this “bourgeois” order would paradoxically come out of the disturbance even stronger than before, buoyed by the French Right’s enormous march down the Champs-Élysées on May 30, 1968, led by none other than André Malraux and Michel Debré. Fifty years later, the result is clear. Though May ’68 did much to change mindsets by inspiring an unwavering devotion to liberty, it is nonetheless true that regression still managed to carve out a niche and prosper – both inside and outside France. That includes the social regression of our globalized world riven by the inequality, shameless exploitation, and mass unemployment that spans all national borders. But this regression is also cultural, as religious obscurantism plays a growing role on the global scene, while the cult of experience has fanned the flames of Disneyfication and left us in thrall to Entertainment. And let’s not forget our mental regression, as mass surveillance has become an omnipresent facet of life under the triumphant regime of consumerism, leaving us no option but futile resignation in the face of Big Data’s digital policing and scrutiny of all the minutiae of our private lives – all for its own mercantile ends. In light of our “post-democratic” botch job and the crass withdrawal of liberty in recent years, the slogans of ’68 sting like a slap in the face, as France in 2018 chokes on its diet of prudence, caution and the return of hierarchies: the Great Night is no longer possible. Requiem for a Revolution. Though we can still applaud and admire the last remaining heroes of the true revolution for liberty – whistleblowers, wikileakers, anti-globalists, and NGOs like Human Rights Watch and Greenpeace – we also need to come to grips with the new reality in which Cristiano Ronaldo, a soccer player, has replaced Che Guevara, the erstwhile icon of revolution, screens have become as ubiquitous as the junk food making our children obese, and individualism has emerged as our preferred way of life. To be sure, these are not the kind of arguments that will have people clamoring for a free and open society. May ’68, at its core, tells a paradoxical story: one in which the fantasy of absolute liberty goes hand-in-hand with the loss of the conditions for this liberty. In 1968, people boarded airplanes without submitting to endless security checks, paid for things in cash, experimented with self-management, cruised the highways in drop-top deathtraps, and skinny dipped at swimming pools in Kabul. And in 2018? We have security portals and PIN codes, corporate ladders to climb, mass obedience to banks, and prohibitions of every kind everywhere, at a time when the personal fortune of the founder of Amazon, a global delivery service, is ten thousand times more interesting to people than the shared and sustainable experience of living in Freiburg’s eco-neighborhood. We can still cherish the world of 1968, despite its naiveté, its delusional utopian culture, and the regime of innocence that formed its ethos. If we cherish 2018, on the other hand, it’s because we despise liberty and because obedience has become a feature, not a flaw, of our daily lives. A text by Paul Ardenne, curator of the exhibition. The exhibition takes place from May 17 to June 17 at 22Visconti. 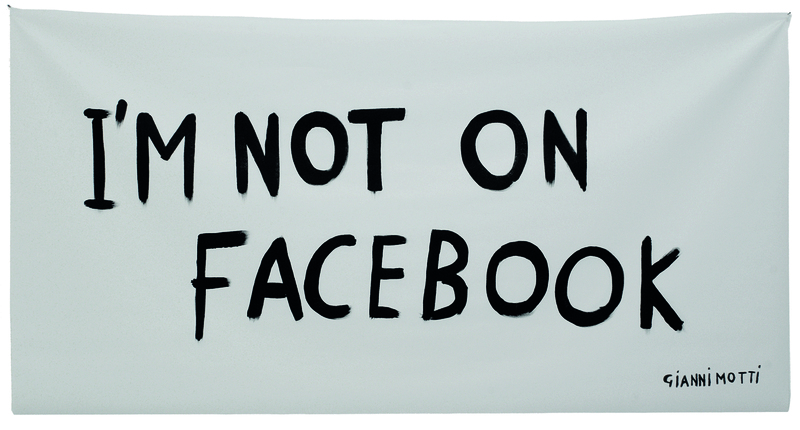 Photo: Gianni Motti, I’m not on Facebook, 2009, peinture acrylique sur bâche.